Buy 1 for $29.71Buy 2 / Save $1.59!Buy 3 / Save $5.94! Size (inches): 0.98" X 0.98" X 2.60"
Spikenard (Nardostachys jatamansi) has a base-note scent that can be described as heavy, earthy, and animal-like. It has an odor intensity of five out of five, and it blends well with lavender, fir, spices, and citrus. 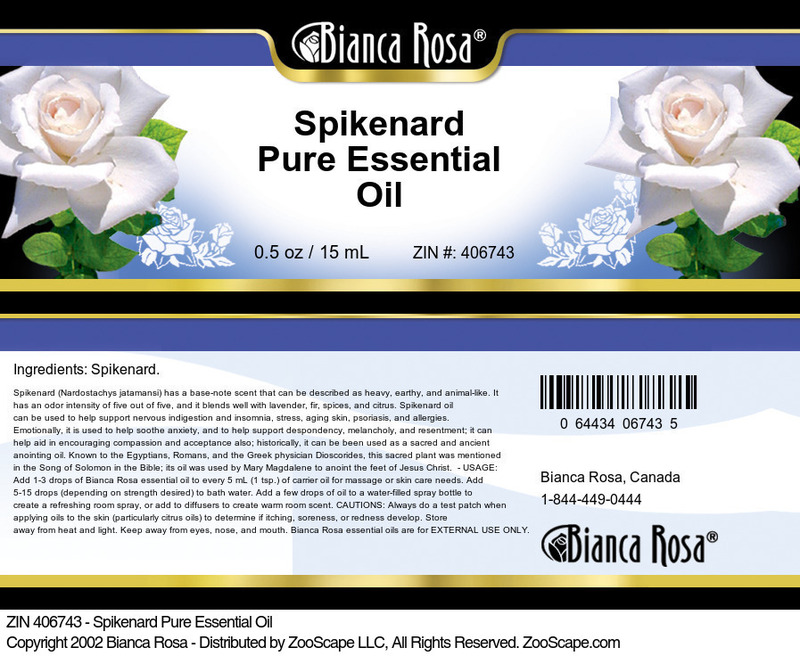 Spikenard oil can be used to help support nervous indigestion and insomnia, stress, aging skin, psoriasis, and allergies. Emotionally, it is used to help soothe anxiety, and to help support despondency, depression, and resentment; it can help aid in encouraging compassion and acceptance also; historically, it can be been used as a sacred and ancient anointing oil. Known to the Egyptians, Romans, and the Greek physician Dioscorides, this sacred plant was mentioned in the Song of Solomon in the Bible; its oil was used by Mary Magdalene to anoint the feet of Jesus Christ. Hello, I just want to say the quality of the product I received was outstanding and superior to the often diluted oils more common in the retail market. Wonderful product. Purity is outstanding. Very aromatic oil which improves after body contact; may not appeal to everyone. It worked very well for a childrens sermon I was using, as this was a spice to anoint Jesus' feet shortly before his death. It was more concentrated than I had anticipated, so I expect I will have this for some years to come. However, the children appreciated smelling the same 'perfume' as did the people of old. Thank you.